Joana Ricou moved from Portugal to America to study art and biology at Carnegie Mellon University. Today, her process begins with a survey of research articles and news. She then contacts researchers directly to discuss their motivation and gather artifacts of their work. In the studio, she builds on these ideas to form questions about our concepts of self and our place in the world, usually in the form of oil paintings. 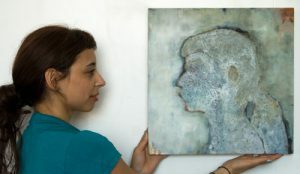 A painting based on her work with Dr. Alison Barth was published as the cover of the Journal of Neuroscience (2005), supporting what has become her core motivation: that art can both support and contribute to science, and vice-versa. This has driven her work in science art and science education, which has led to collaborations with galleries, schools, and museums in Portugal and the USA, including the Andy Warhol Museum (2007), the Carnegie Science Center, Pittsburgh Zoo & PPG Aquarium, Children’s Museum of Pittsburgh and the National Aviary (2010).